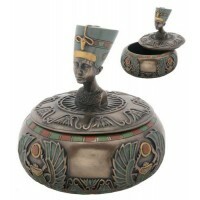 Based on the famous bust of the Egyptian Queen Nefertiti, this bronze resin bust is actually a box with lift off top. Measuring 10 3/4 inches tall, this lovely Nefertiti bust has a secret - the very top of her headdress lifts off revealing a storage compartment inside - a unique and lovely box for your desk or bookcase. Cold cast bronze resin with hand painted color detail. Item Number: UI-WU77179A4 | Approximate Size (Inches): 4.50 wide x 4.50 deep x 10.75 high | Approximate Shipping Weight: 3.00 lbs.